With most stories, the sources of inspiration are buried somewhere in my mind. Maybe something surfaces, like the end of a tangled ball of twine, and it pulls me into a story. The octopus story might have started at the Aquarium of the Bay in San Francisco back in 2012, when they acquired three Giant Pacific Octopuses that were bycatch for crab-fishers. We went to see them – and it was remarkably difficult, because they camouflaged so well, and could slide their ample bodies into tiny crevices. In fact, we only saw one of them – with the help of a docent and careful directions. Fast forward to three books about octopuses: The Soul of an Octopus, by Sy Montgomery. Other Minds: The Octopus, the Sea, and the Deep Origins of Consciousness by Peter Godfrey-Smith. And Octopus: The Ocean’s Intelligent Invertebrate, by Roland C. Anderson, Jennifer A. Mather, and James B. Wood. I read them all in the space of a few weeks, and then I knew I wanted to write this story. Of course that meant a deep dive (sorry!) into octopus territory. I found a 149-page care manual for GPOs from the Association of Zoos and Aquariums. And a thirty-page Giant Pacific Octopus Husbandry Manual from the British and Irish Association for Zoos and Aquariums. An article in Cosmos magazine, How the Octopus got its Smarts. Any number of Youtube videos, including this one which was a literal deep dive into octopus territory! And lots more random articles. When I had the first draft done, I wanted an authenticity read (Within the limits of a sci-fi story!). I wondered if one of the authors of the last book would be willing. Dr Anderson had sadly died in 2014, but Dr Jennifer Mather was kind enough to review the draft for me and provided some helpful comments. I’m very pleased to acknowledge her help. So that’s the story of the story. I’m delighted Escape Pod published it – and also had an interview Dr Mather for the podcast! The Soul of an Octopus: A Surprising Exploration into the Wonder of Consciousness by Sy Montgomery. Other Minds: The Octopus, the Sea, and the Deep Origins of Consciousness by Peter Godfrey-Smith. Octopus: The Ocean’s Intelligent Invertebrate, by Roland C. Anderson, Jennifer A. Mather, and James B. Wood. AZA Aquatic Invertebrate Taxon Advisory Group (AITAG) (2014). Giant Pacific Octopus (Enteroctopus dofleini) Care Manual. Association of Zoos and Aquariums, Silver Spring, MD. I’m thrilled that Escape Pod has published my story, Octonet as both a Podcast (read by S. B. Divya) and in text. I love how it’s come out. And special thanks to Dr Jennifer Mather, co-author of Octopus: The Ocean’s Intelligent Invertebrate, for reviewing my draft. “Sometimes at night when my mind is calm, I think I hear the octopuses. Around the world, the great network of molluscan philosophers. I was delighted to find that ‘Light and Death on the Indian Battle Station was reviewed in Locus at Locusmag.com. Karen Burnham mentions it as one of the two stories she most enjoyed in the October 2018 issue of Fireside (together with the amazing and powerful ‘STET’). And because I really loved the art for that story, here it is again. Constellary Tales has accepted my short story, A Scent of Roses. This story has been through many name changes. It started out as The Scent of a Dead Rose. (It actually was inspired by the intense perfume of a bouquet of dying roses in my room.) Then I changed it to A Duty of Grief, which better represented the story as I’d written it. Finally, I submitted it as A Haunting Scent of Grief... and Constellary Tales accepted it! In the edits, they asked me to change the name to A Scent of Roses. They felt that the title I’d used gave away too much. I agreed, because why not? I’m looking forward to seeing it published in Constellary Tales – soon. I’m thrilled that my short story, Lepers, has appeared again. It’s an 1100-word horror story set in Mumbai, near VT – Victoria Terminus, now renamed Chhatrapati Shivaji Terminus. It was written way back, and has been republished several times – and morphed along the way. The latest iteration is in Mysterion, “an ezine of Christian-themed speculative fiction…” I did a partial rewrite of the story for this version, and I think bringing in religion gives the story additional depth and draws out some of the dilemmas at its heart. ETA: It’s not on the cover… but it’s still a gorgeous, perfect illustration! I was thrilled when Fireside accepted my story, Light and Death on the Indian Battle Station, and now it’s out. There’s a new anthology in the Insignia series of Asian-flavored speculative fiction: Asian Birds and Beasts. Here’s the cover, with the same styling as the previous five anthologies. It’ll be coming out August 20th, 2018 as an ebook. My story is a sort-of-reprint – it’s a greatly expanded version of a flash piece first published as Lena. I’ve always wanted to flesh out that story, and I’m happy it found a new home. Plus a special reprint by Edward Bryant. This story was first published in their Kurt Vonnegut Tribute Anthology, Cat’s Breakfast. Then, out of the blue, they asked if they could reprint it for the year-end anthology. I was, of course, delighted! A new anthology from Third Flatiron Publishing – it’s called Cat’s Breakfast: Kurt Vonnegut tribute. It’s available on Amazon as an e-book, and a print edition is planned. It includes my story, Picnic, with Xels. I’m thrilled to see it published. This is one of my early stories, and a favorite of mine for many reasons both writing-related and personal. I was just counting up my short stories and poems published. This is the 26th. Thanks, Clarion! I’m delighted that my short story, “Spoiling Veena” is in this awesome new, very timely, anthology. I’m really looking forward to reading the whole book. The charity anthology Mosaics, A Collection of Independent Women, Volume I has just come out. (The second volume is already under way.) It benefits the Pixel Project, a charity that is trying to fight domestic violence across the world. Their slogan is, It’s Time To Stop Violence Against Women. Together. I’m proud to say that it includes my story, Happily Ever After in Twelve Stained Glass Panels. Here’s the blurb: Whatever happened to the Miller’s Daughter, the one who spun gold into straw? This is the part the Brothers Grimm didn’t tell us. Selling a story to this anthology was a quick education in how to promote an Indie book. Some of the stuff they did: An illustration for every story, except these were for use on social media, not for the book. The hashtag, #IamAMosaic for everyone to use when they discussed their stories or the anthology. Lots of stuff on Twitter. Asking all the authors to try to get readers to post reviews on Amazon on Launch Day, and providing us free Advance Reader Copies (ARCs) that we could offer for the purpose. A Facebook launch party, with giveaways, including a Kindle Fire. It went at a breathless pace that I wasn’t quite prepared for (especially since it happened when I had other stuff going on) but built momentum. I hope very hard that this antho succeeds. It’s a very worthy cause, and Pavarti Tyler and Kim Wells have thrown themselves into promoting it. Unsung Stories, the UK-based online magazine, published my story, The Mother Goose Crisis. When a nursery-rhyme virus threatens to take out the internet – and possibly its users too – a creative solution is needed to save the world as we know it. But what, and can the tech team pull it off? The story is short and light-hearted. I wrote the first draft years ago, in the era when 5 1/4 inch floppies still existed. From time to time, as I do with all my stories, I’d pull it out, revise it and update it. (There is no such thing as a Trunk Story – only one that hasn’t yet found its purpose.) The floppies in the story became 3 1/2 inches. Then they became thumb drives. The cast changed a bit. I still found it amusing, but had no idea where to send it. So I sent it off, and here it is. I’m delighted. 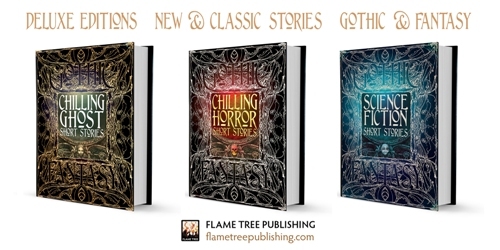 Flametree Publishing, a UK-based publisher, is coming out with three awesome collections of stories classic and new: Ghost stories, Horror, and Science Fiction. 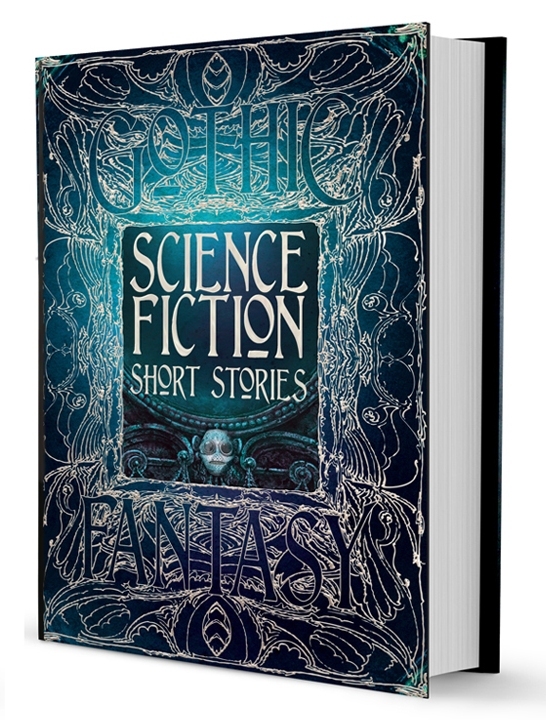 They’re publishing my story, “Genetic Changelings,” in the Science Fiction anthology.